If you are traveling from the Baltimore Washington area, or anywhere generally south of Reading, and wish to avoid the long-term construction projects along I-83 and US Route 222, we can recommend another route. The alternate is actually about 19 miles shorter than the "quickest" I-83/Rte 30 /Rte 222 route, that all the mapping programs will send you along. But in normal conditions - meaning without construction delays - the alternate does takes longer due to slower speed limits and a number of small towns you will pass through along the way. If you can't stand doing 55, 50, and even 40 at times on country roads, and slowing down to 30 or 25 for the villages and towns, you better stick to the Interstates. But if crowded Interstates, Jersey barriers, flagmen, work-zone speed limits, and bevies of big rigs are something you would not mind paying a time premium to avoid, this may be for you. 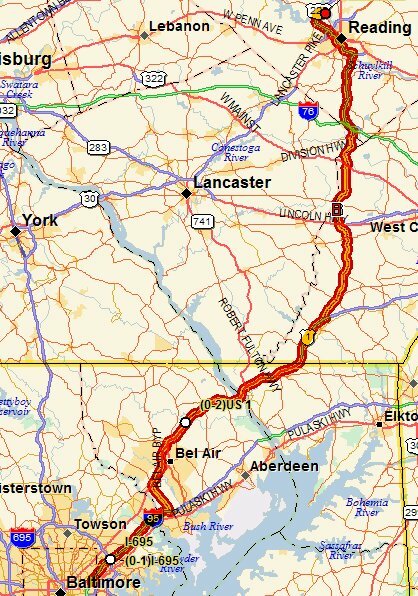 It is a much more relaxing drive, taking you across the scenic Conowingo Dam, over a few tree-cloaked mountain ridges and through some beautiful Pennsylvania Dutch countryside and small towns on good, four and two-lane roads, with a bit of divided access highway on either end. According to the DeLorme Street Atlas 2006 USA program, from which these maps were printed, and which we highly recommend, that penalty is only 6 minutes! But don't you believe it. It's more like half an hour on a good day and a bit more on a Sunday when you are slowed down by the occasional Amish horse and buggy. Sound good to you? OK then, we'll start you out on the north side of the Baltimore at the junction of the Baltimore Beltway, I-695 and I-95 North. You could take US Rte 1 North right from the start, but this section is riddled with traffic lights and has nothing to recommend it unless you are looking for fast food and shopping centers. (More on food a bit later.) Instead, we'll take I-95 for a bit before kicking over to our country drive. Keep a stiff upper lip - we'll be leaving all those tractor-trailers and commuters behind shortly. At Mile 0 From I-695 take Exit 33 onto I-95 North toward New York. Zero your odometer and we'll give you the approximate accumulated mileages along the route. At Mile 14 Turn right onto US 1 North. By the way, the gas stations in this area of Harford County, MD are often, but not always, the cheapest along the whole route. Cross the Mason-Dixon line leaving the 'Old Line State' and enter the 'Keystone State'. pull out of the lot and take a left onto Rte 10 North. Rte 10 takes a right turn in the little town of Cochranville, so be looking out for it and stay with 10. You'll pass through Parkesburg, cross Rte 30 where there are a couple more good places to gas and snack up, staying with Rte 10. In the village of Compass, Rte 10 takes another right turn where it crosses Rte 340. Go right at the intersection. If you go straight on through at the crossroads you will find yourself on Rte 340 going west, which is entirely the wrong direction. It's well marked, just watch for the signs. Next you'll go through the town of Honey Brook. Take the Fry Road ramp onto I-176 North. Now you can let the horses out on this lightly traveled divided access highway. Keep an eye peeled for deer. I-176 ends where it joins US Rte 422. Bear left for Reading. Be careful where the ramp spills you onto US 422 as there is no merging lane. OK, we're on base leg now. The city of Reading will appear on your right as you cross the Schuylkill River. 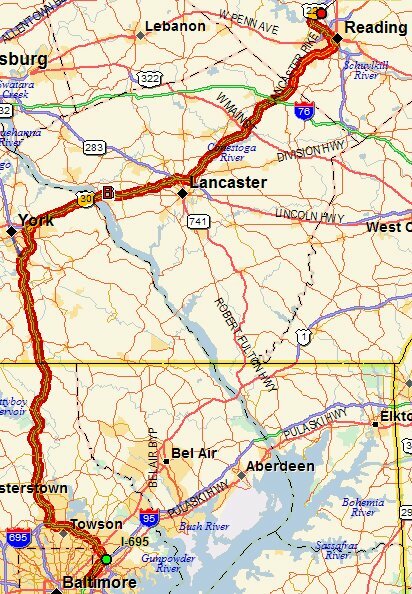 US 422 merges with US 222 North toward Allentown, follows the river course, bends away briefly to the northwest, then swings back northeast as it bypasses the city and circles around to the north of Reading, where the airport is situated. Make note of the shopping areas on the left side of the highway where you will find many hotels and restaurants. We are now on short final so I'm handing you off to the tower - I mean Local Map and Directions.